Although this is the saying, most brides are terrified of the possibility! That is why I am here to help save the day! Rain shouldn’t be feared! 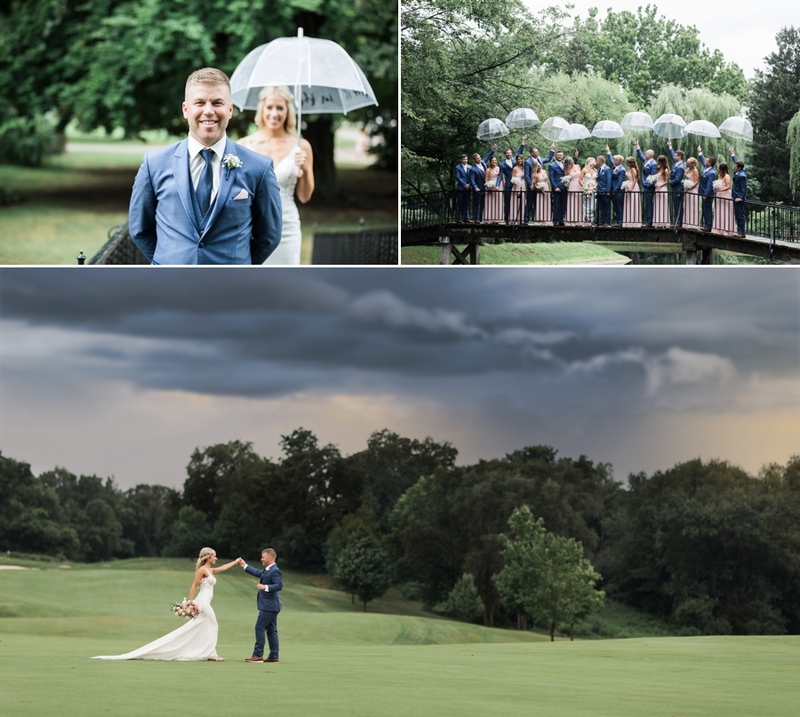 There are still ways to get gorgeous images during a rainy wedding day. HERE ARE SOME OF MY TIPS FOR WONDERFUL RAINY DAY PHOTOS! Venue – Make sure your venue has enough shelter and lots of room indoors for your guests to move around and not feel too cramped if everybody ends up spending the day inside. We can also use arches and other areas of cover for photos which make you look like you are outside, and are actually not. Also consider venues we we can shoot inside. Hotels with large windows, or a greenhouse possibly. Arches always work well and you can fit lots of people into doorways and under overhangs. Umbrellas!!! 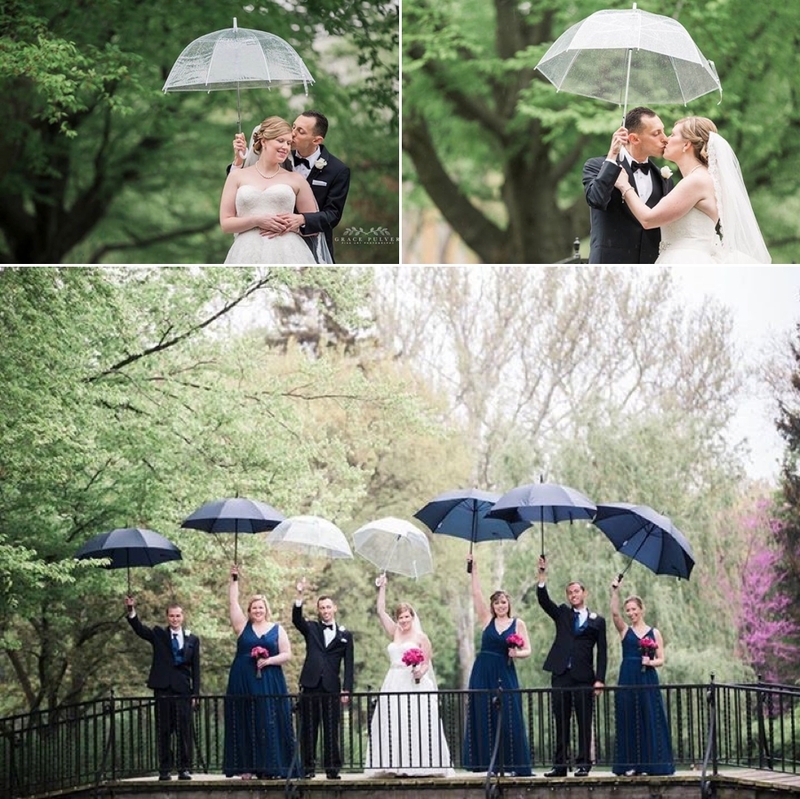 – Stock up on some umbrellas, especially for your wedding party. Matching umbrellas are always cute. I do stock up on clear ones, but don’t have enough to cover large wedding parties. You can purchase clear umbrellas from Amazon for fairly cheap. Check the Radar – Know that the rain can affect the timings of the day, especially photographs, its good to hold out for the rain to calm down, so be ready to go outside at a moments notice. Sometimes we need to be flexible with our timeline and discuss altering it slightly to be able to go outside when the radar is calling for no, or light rain. Dress – It is always a good idea to have great bridesmaids to help carry your dress so it doesn’t get too wet from the ground. We can discuss laying down clear plastic too to prevent it from getting wet. Embrace it! - Consider using the rain to your advantage. Get some of those cool night shots. Also the sky is always the most dramatic during a storm! Use that to your advantage! Remember, it is your day! All that really matters in the end is that you two are married. We can get great images in the rain, with the wind and lots of sun. ENJOY YOUR DAY and leave the planning to your photographer!